The movement to normalize relations between the U.S. and Cuba is coming to Harlem this summer: from August 15-21, the first annual Harlem/Havana Music & Cultural Festival will bring Cuban musicians, artists, dancers, chefs, educators, and more to New York as part of Harlem Week 2016. Then, in February 2017, a U.S. delegation of artists and cultural leaders, including Smokey Robinson, will go to Havana to participate in the Cuban counterpart of the festival. The exact dates of that half of the exchange have yet to be announced, but Smokey is very excited, and said that his previous trip to Havana was "a Wonderful Life Experience" for him. Harlem Meets Havana 9/3/2015 Huff Post: by Rep Charles Rangel - "I am proud that this summer a delegation of Harlemites led by The Greater Harlem Chamber of Commerce (GHCC)’s President Lloyd Williams and Council member Inez Dickens returned from their successful mission to Havana, Cuba, where I helped arrange their meetings with senior officials of the Cuban government regarding trade, business and tourism and our anticipated first annual cultural exchange program in 2016 — Harlem Meets Havana." Arte, de Cuba a Nueva York 7/1/2016 Vistar: "Harlem-Havana Music and Cultural Festival es la nueva puerta que— a través de la música, las artes visuales, la danza, el cine y la comida criolla— muestra a Cuba y su cultura en Estados Unidos. Previsto del 15 al 21 de agosto, el evento, en su primera edición, llevará a artistas cubanos hasta Nueva York, y los hará protagonistas de varios espectáculos." Harlem and Havana Connect in Culture Festival 6/26/2016 Cuba Journal: "The Harlem/Havana Music & Cultural Festival will bring Cuban artists to New York in August for a week of performances and other events – followed by a similar cultural exchange in Havana in February. New York Governor Andrew Cuomo and U.S. Representative Charles Rangel, a longtime Cuban Embargo opponent, have been working for years on developing cultural exchange ideas between the US and Cuba. A contingent of American artists with Harlem connections, including Smokey Robinson, are slated to travel to Havana for a similar showcase of cultural exchange in February 2017." 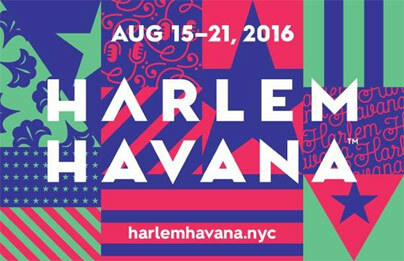 First Annual Harlem-Havana Cultural Exchange Is Coming To NYC This August 6/25/2016 Gothamist: "The movement to normalize relations between the U.S. and Cuba is coming to Harlem this summer: from August 15-21, the first annual Harlem/Havana Music & Cultural Festival will bring Cuban musicians, artists, dancers, chefs, educators, and more to New York as part of Harlem Week 2016." New York Gov. Cuomo Announces Harlem/Havana Music & Cultural Festival 6/24/2016 Billboard: "Cuban musicians, visual artists, dancers, filmmakers, chefs and educators will be highlighted during this years Harlem Week from Aug. 15-21. They include saxophonist César López and his Habana Ensemble, and pianist Jorge Luis Pacheco, a young lion who was selected by Wynton Marsalis to perform with the Jazz at Lincoln Center orchestra during the New York big band’s trip to Havana in 2010." Harlem in Havana Project - E-News - March 2016 3/15/2016 Harlem in Havana: "I am so excited to share updates for the film project about Harlem in Havana. Six years in the making, the film will be completed by the end of 2016. Our goal is to launch the film in early 2017, exactly 50 years after Harlem in Havana’s last bally! " The press conference was held at Sylvia's, Harlem on June 24 2016.